Our club is 100% self-funded. Our fundraiser helps us support our Midshipmen. The North Carolina USNA Parent’s Club is proud to offer a special-order cooler for all Navy families and Midshipmen! Coolers are blue with yellow embroidery. Logo and personalization is placed on the front pocket. 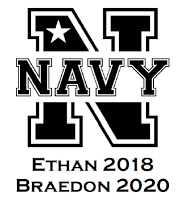 The logo can also be personalized to include the Midshipman’s name and graduation year. Cooler features front zippered pockets, 2 mesh side pockets, a top insulated compartment, and holds up to 30 cans in the main compartment. 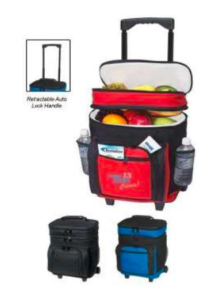 Coolers are made of 600D polyester with a PVA lining and have a retractable auto-lock handle.